It’s that time of year again! Summer is ending and we’re kicking it into high gear for back-to-school season. 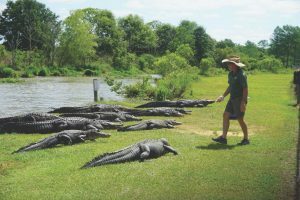 No worries here though – we’re ready to brighten up your school year with an action-packed field trip to Alligator Alley in Summerdale, Alabama. Alligator Alley is a unique learning adventure for all ages. 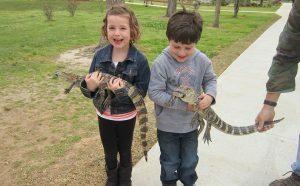 We have special opportunities for the kiddos and teachers to witness alligator feedings, hold baby alligators and enjoy a tour along our boardwalk. Witness more than 600 alligators – from hatchlings to mature adults – in their natural habitat, all while viewing turtles, ospreys, owls and frogs just a few feet away. It’s the perfect place to relish in the outdoors and get out of the classroom for a hands-on learning experience you will never forget! During your field trip, you can stop by the air-conditioned alligator station to get your hands on a baby alligator. Our expert staff members are always nearby to chat and answer questions about each animal. If you want to get your heart pumping, be sure to hang around for the live feedings that happen every day during peak season at 11 a.m., 1 p.m. and 4 p.m. After all the excitement, you can enjoy your lunch at the shaded picnic tables right across from the viewing area. Field trip prices are set at special rates and teachers and bus drivers have free admission! 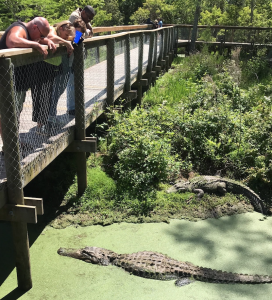 Visitors also have the option to buy alligator chow to feed the alligators while walking the boardwalk and taking in the wildlife.